The son of a Banff shipmaster, and brother of sculptor Alexander Brodie, he worked as a plumber in Aberdeen before moving to Edinburgh in 1847 to study sculpture at the Trustee's School of Design, c. 1851-3, then studied in Rome under Laurence MacDonald. Returning to Edinburgh, he established a successful practice specialising in portrait busts, public monuments and architectural sculpture. For Glasgow, he executed the statue of Thomas Graham, George Square (1871-2); a marble statue of John Graham Gilbert, Kelvingrove Art Gallery (1870); and the statue of the Young Scholar on the former Buchanan Institute, Greenhead Street (1873). In 1872, he carved a statue of St. Andrew for the City of Glasgow Assurance Company, 28-36 Renfield Street, as a companion to G E Ewing 's St. Mungo, but these were lost in 1929 when the building was demolished. In 1875, he was one of three sculptors invited to submit designs for Glasgow's David Livingstone Monument (for George Square). Although unsuccessful, his model is now displayed at the David Livingstone Centre, Blantyre. His funerary monuments in the city include the John Graham Gilbert Monument, designed by Charles Heath Wilson and David Thomson, Necropolis (c. 1863); the bronze relief portrait of Rev. Duncan Macfarlan, Necropolis (1860); and the 71st Highland Light Infantry Memorial, Glasgow Cathedral (1863). 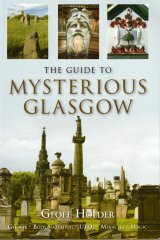 He also provided Edinburgh's cemeteries with some of their finest monuments and portrait reliefs and busts. These include the Classical mausoleum in Dean Cemetery for James Buchanan, the founder of the Buchanan Institution in Glasgow, for which Brodie carved the statue of the Young Scholar. For the mausoleum he produced a colossal bronze bust of Buchanan and a bronze door with a relief of a female mourner. Other works nearby are the monuments to the engineer Robert William Thomson, with a portrait medallion (1873), and the fine monument to the painter Sam Bough, which also features a huge portrait madallion (1878). Amongst his other commissions for public sculpture are: the statue of Prince Albert, Perth (1864); the statue of Amy Robsart on the Scott Monument, Edinburgh (1881), and the famous Sky Terrier on the Greyfriars Bobby Drinking Fountain, Edinburgh (1872). He also produced a bronze statue of Hercules, now at Port Merion, Wales (1850), and the Moffat Ram, on the William Colvin Drinking Fountain, Moffat, which caused Brodie much embarrasment when it was pointed out at the unveiling that the ram had no ears. His critic was wrong, however, as the ram's ears were hidden by the thick fleece for which the breed (Blackfaced) was renowned, and which the sculptor depicted, therefore, with great accuracy (1875). Exhibiting work at the RA , RSA and RGIFA , from 1847, including a bust of Queen Victoria for Balmoral (1868), he was elected ARSA , 1857, RA , 1859, and served as Secretary of the Scottish Academy, 1876-81. Brodie died in Edinburgh on 30 October, 1881, at his home in Cambridge Street, and was buried in the city's Dean Cemetery, where his grave is marked by a simple granite monument surmounted by an urn.